In our post earlier this week, we showed a photo from one of Billy Graham’s first crusades—Los Angeles 1949. The “canvas cathedral”—as the massive tent composed of two circus tents was known—was pitched at Washington Boulevard and Hill St. in Los Angeles, Calif. It was here that Billy Graham first gained national media exposure as an evangelist. Originally scheduled for three weeks, the local committee urged Billy to extend the campaign. While the decision was placed with Mr. Graham, he prayed and asked God for guidance in his answer. The resolve came as a well-known local radio host was moved by Billy’s sermon and invited his listeners to join him in making a public profession of faith at the tent meeting. The Los Angeles Crusade was extended five times for a total of eight weeks, ending on November 20, 1949. More than 350,000 people attended at least one of the 72 services held during the meetings. More than 2.5 million people attended Billy Graham’s seven Los Angeles Crusade campaigns in 1949, 1958, 1963, 1969, 1974, 1985 and 2004. When one man listens to the VOICE of God countless souls destined to the devil’s hell can we transferred into God’s glorious Kingdom. My prayer is that I too will listen to God’s Voice. A parable from the NT states God will bless some 30 fold, some 70 fold, and some 100 fold. History illustrates to us in the life of Dr. Graham what it means to be blessed 100 fold. That radio host was Stuart Hamblen, who was the #1 radio personality on the air back then; and after becoming saved in Billy’s apartment on Oct 18, 1949, gave up his radio show and toured with and for Billy Graham all across the country, sharing his story of how Christ had changed his life. I think the Crusades are wonderful. Love to see them on RBN. Praise God for Billy Graham and his family and his whole team. God has used Billy Graham in a marvelous way. His teachings helped me realize God’s plan of salvation through his TV ministry. Never have had the opportunity to attend one of his revivals. I praise God for Billy Graham and the way He has used him over the years and for Billy Graham’s faithfulness to serve us. What a great man of God he is. I’m sure he has changed history to a degree. If all those who were touched by his ministry would join together and pray for our nation now, I believe we would see change! I attended one of Billy Graham’s Crusades it was such a blessing. Praise the Lord for His blessings over Billy Graham and the impression he made on the world through his ministry. Lots of those people are in Heaven today thanks to Rev Graham. The Lord has and still is using him in mighty ways. I’m sad to think this wouldn’t happen today. The people wouldn’t be interested, think they had need or bother to come. What a sad commentary on our world today. But God is still using RevGraham and his organization and children and grandchildren. Thank you Lord for this godly man and his service to you. I was there! It was amazing. I was young at the time, but it left a lasting impression. My parents had their first date at this Crusade. My mother was 15 and Dad was 18. They still talk about this Crusade today after 65 years of marriage. God continues to bless us. As a college freshman in 1957 I watched Dr. Graham’s Madison Square Garden Crusade over and over on our big old TV, fascinated and inspired. A year later I was living in LA when the Crusade was there. That time I knew that inspiration was the power of God! I have thought of him as “My Pastor” ever since though I was not a Baptist until a few years ago. He has been a blessing, giving hope and faith to this nation in some very trying times, and I thank God for him! Bless you, Dr. Graham, and thank you! My father, Lawrence Young, was on the Christ for Greater Los Angeles committee that put together the revival. I attended services. Left out of the LA Crusades dates is the 1951 Hollywood Bowl Crusade. That is where I became a Christian. I was 15 years old and attended Sunnyside Baptist Church in South West Los Angeles and we teen s all attended most nights. Will always remember those wonder days and I can hear him preaching now. Many lives were blessed by these events. This is actually a question, rather than a comment. Would you be so kind as to provide me with the actual month and day, in 1963 when Rev. Graham held his crusade in the Los Angeles area? 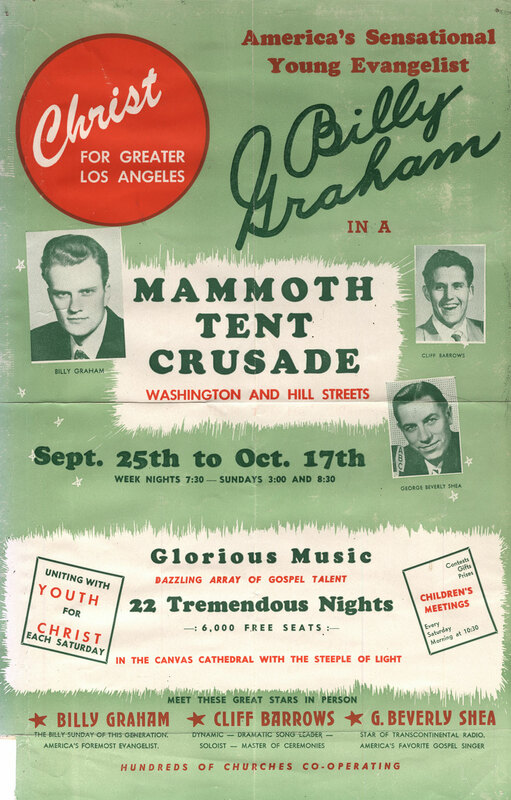 Billy Graham’s 1963 Crusade in the Los Angeles area was held from August 15-September 8. I would love to share my story with you . God willing. In Jesus name. I know that the Lord has used Billy in a mighty way. I thank God for him. And I thank God for Franklin Graham. Amen. I Pray that I would here from you Personally . IN JESUS NAME . If you would still like to share your story, please email media@bgea.org. Thanks! My mother took some of us to see Billy Graham in 1958 at The Los Angeles coliseum..If i remember correctly i accepted Jesus Christ at that time..